American Tank Company’s line of collapsible tanks provide a mobile, and reliable source of FDA approved water for human consumption. Collapsible tanks are also ideal for feeding livestock, crop spraying, or mixing fertilizer, pesticides or herbicides. 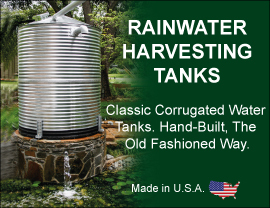 American Tank Company’s collapsible water tank products are made of rugged polyvinyl chloride (PVC) coated nylon, which resists chemical contamination, mildew, rot and solar heat exposure. These tanks are electronically heat sealed and capable of withstanding severe outdoor exposure. American Tank Company’s collapsible tanks come in 6 sizes and, when empty, can be handled easily by one person, and yet holds from 525 to 1340 gallons! A Collapsible Tank can be filled and emptied in minutes, with the aid of a centrifugal force pump, or simply drained by gravity flow. Convenient to fill and drain because of the 10"diameter flexible sleeve on top for filling and the 1½" gate valve mounted on an 8" PVC extension pipe for easy draining. Collapsible Water Tanks can be folded up and stored in an 19" x 19" x 19" carton. Call toll free today: 1-800-655-9100 to speak to one of our friendly and knowledgeable Collapsible Tank Specialists.